No, Toyo Odagiri is not looking at her cellphone. This is 1952, okay? 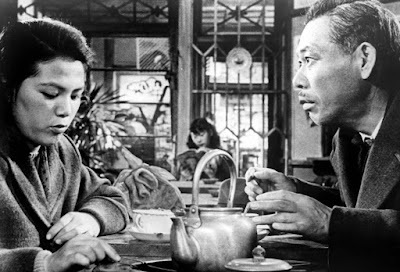 I love Akira Kurosawa's films, which hyper-link into many deep things: Japan, the universal human condition, Russian literature, existential philosophy, songs, theatre, visual design and so much more. 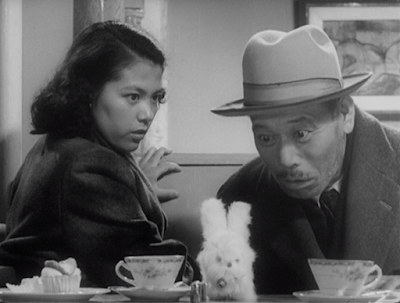 I also love that Kurosawa's films sometimes meander a bit unexpectedly, like a good novella or novel. 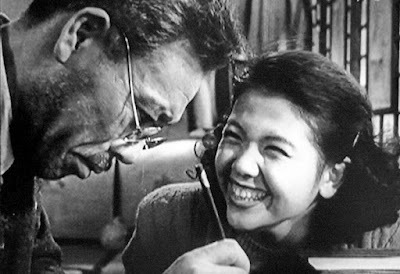 Ikiru (1952) is, indeed, inspired in part by Leo Tolstoy's The Death of Ivan Ilyich (1886), and the spirit of Fyodor Dostoevsky is there, too. The premise of Ikiru: what happens when a person -- in this case Mr. Watanabe (Takashi Shimura) -- figures out that he (or she) has only six months or a year to live? For one thing, Mr. Watanabe wants to spend more time hanging out with Toyo Odagiri (Miki Odagiri aka Santo), who is so full of life and mischief. Ikiru also has the feel, at times, of Charles Dickens' 1842 novella, A Christmas Carol in Prose, Being a Ghost-Story of Christmas. Though Mr. Watanabe is not such an awful man as Scrooge, he's often just as (almost comically) freaked out when he first glimpses his own mortality. 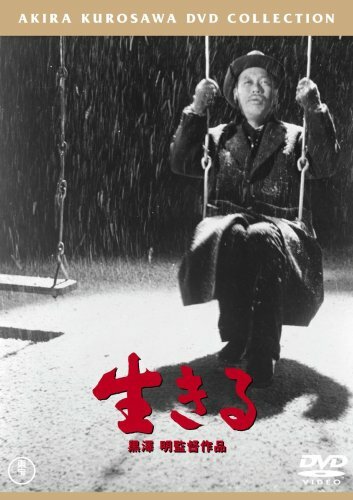 Ikiru is a film about nothing less than the meaning and purpose of life. As Roger Ebert phrased it on September 29, 1996: "I think this is one of the few movies that might actually be able to inspire someone to lead their life a little differently." (Link to full article here.) No higher praise needed.